A bunch of out-of-work ex-service men in Portland, Oregon, figured they needed their bonus now; 1945 would be too late, only buy wreaths for their tombstones. They figured out, too, that the bonus paid now would tend to liven up business, particularly the retail business in small towns; might be just enough to tide them over till things picked up. So three hundred of them started east in old cars and trucks, hitchhiking, riding on freight trains. By the time they reached Council Buffs (Iowa) they found other groups all over the country were rebelling against their veterans' organizations and getting the same idea. It was an Army. They organized it as such and nicknamed it the Bonus Expedition Force. When war came in 1917 William Hushka, 22-year-old Lithuanian, sold his St. Louis butcher shop, gave the proceeds to his wife, joined the Army. He was sent to Camp Funston, Kansas where he was naturalized. 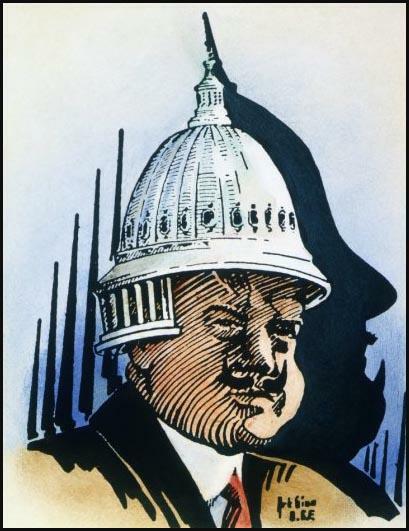 Honorably discharged in 1919, he drifted to Chicago, worked as a butcher, seemed unable to hold a steady job. His wife divorced him, kept his small daughter. Long jobless, in June he joined a band of veterans marching to Washington to fuse with the Bonus Expeditionary Force. "I might as well starve there as here", he told his brother. He took part in the demonstration at the Capital the day Congress adjourned without voting immediate cashing of the bonus. Last week William Hushka's Bonus for $528 suddenly became payable in full when a police bullet drilled him dead in the worst public disorder the capital has known in years. A few weeks later there was more talk of revolution when the Bonus Expeditionary Force descended on Washington. 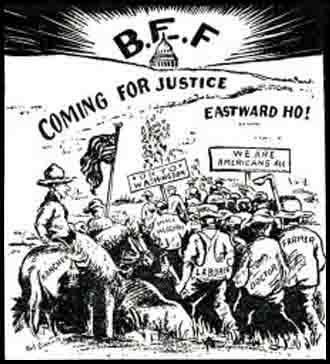 The BEF was a tattered army consisting of veterans from every state in the Union; most of them were old-stock Americans from smaller industrial cities where relief had broken down. All unemployed in 1932, all living on the edge of hunger, they remembered that the government had made them a promise for the future. 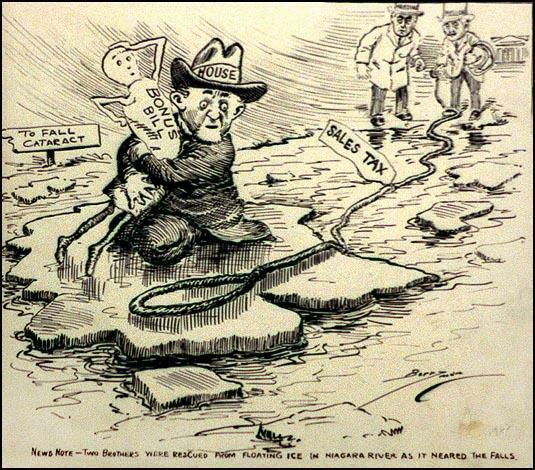 It was embodied in a law that Congress had passed some years before, providing "adjusted compensation certificates" for those who had served in the Great War; the certificates were to be redeemed in dollars, but not until 1945. Now the veterans were hitchhiking and stealing rides on freight cars to Washington, for the sole purpose, they declared, of petitioning Congress for immediate payment of the soldiers' bonus. They arrived by hundreds or thousands every day in June. Ten thousand were camped on marshy ground across the Anacostia River, and ten thousand others occupied a number of half-demolished buildings between the Capitol and the White House. They organized themselves by states and companies and chose a commander named Walter W. Waters, an ex-sergeant from Portland. Oregon, who promptly acquired an aide-de-camp and a pair of highly polished leather puttees. Meanwhile the veterans were listening to speakers of all political complexions, as the Russian soldiers had done in 1917. 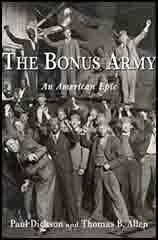 Many radicals and some conservatives thought that the Bonus Army was creating a revolutionary situation of an almost classical type. Order and civil tranquility are the first requisites in the great task of economic reconstruction to which our whole people now are devoting their heroic and noble energies. This national effort must not be retarded in even the slightest degree by organized lawlessness. The first obligation of my office is to uphold and defend the Constitution and the authority of the law. This I propose always to do.